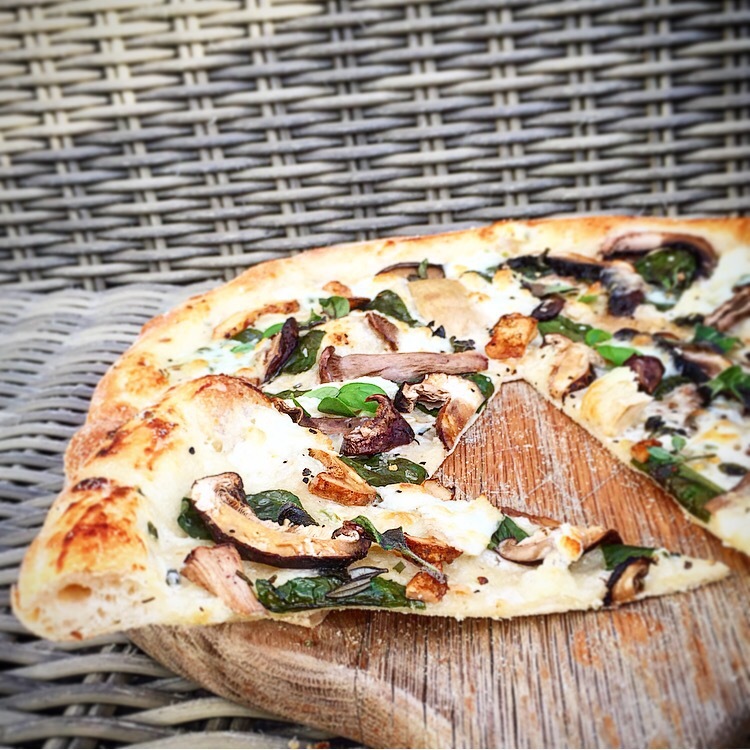 When it comes to pizza, which would be my specialist subject if I was ever on mastermind, you can get technical with sourdough starters, cold fermentation and wood ovens but this is a perfectly lovely, simple and easy recipe to get you started. If you keep a well-stocked cupboard you should have all the ingredients you need without making a trip to the shops and you don’t need to buy any special equipment before you begin. 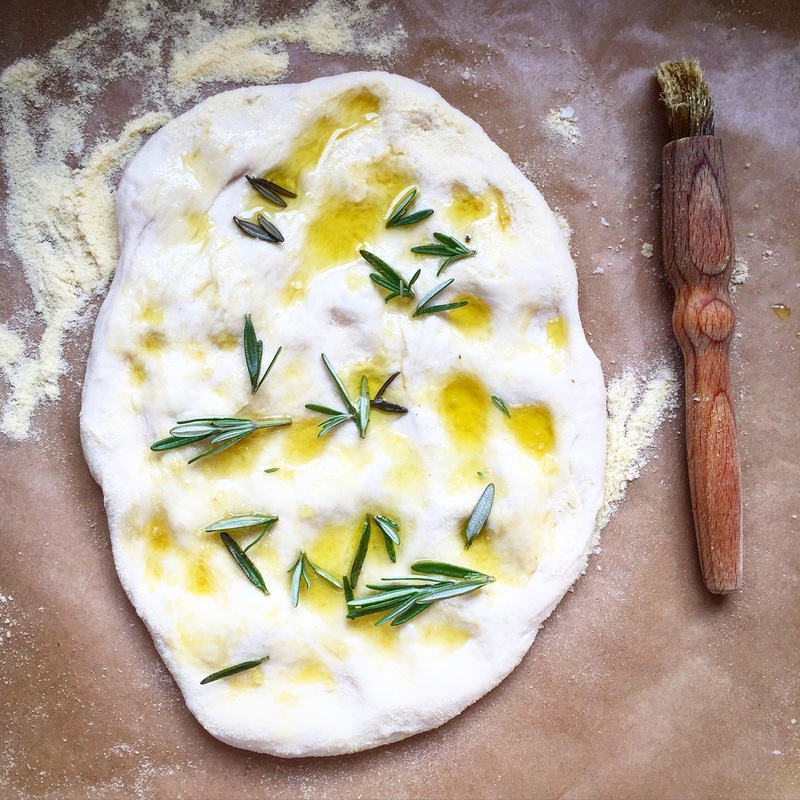 I’m hoping that you’ll enjoy making this dough so much that you’ll never resort to a pizza delivery again. 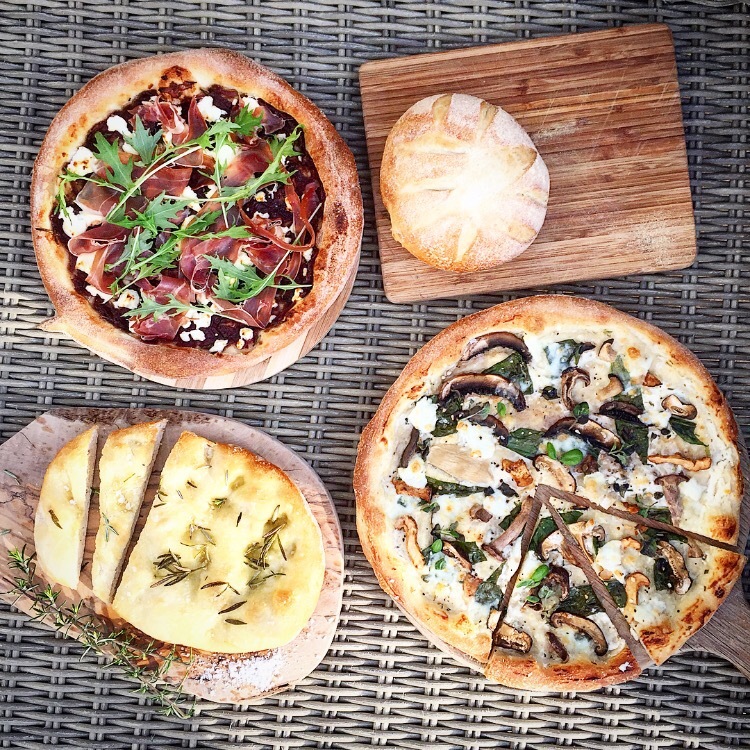 Just think about how rewarding it will be to make your own pizzas and garlic bread from scratch rather than just opting for a take away? You can invite a friend over and make this recipe together, I guarantee you that instead of the feelings of guilt that usually come after a greasy take out you’ll be feeling proud as punch. 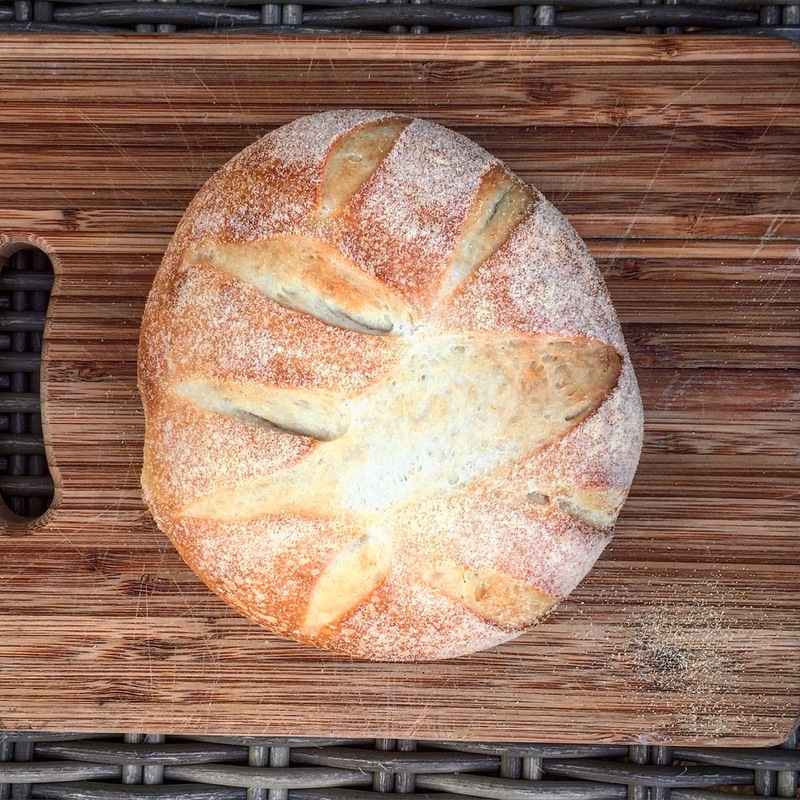 It’s a brilliant dough for a beginner so if you’ve not made bread or pizza before you can start with this to build up your confidence. As you can see theres a lot of hidden E numbers and modified ingredients, which you really want to try and avoid. Good news is you can still enjoy lots of meals out. Luckily for us there’s a growing amount of independent restaurants, bars and cafes with a brilliant philosophy to eating well. They use fresh, seasonal ingredients and you can trust you’ll be getting a good, nutritional meal when you eat at them. Don’t be afraid to ask questions about what’s in your food, establishments are required to provide you with ingredient information. What goes into your body should be one of your top priorities. 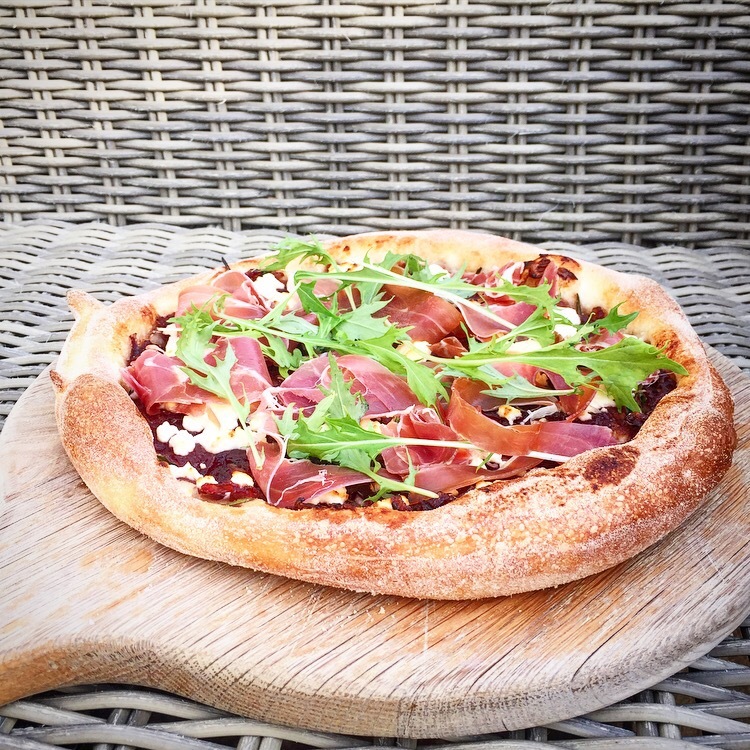 Try and balance your daily food intake too, if you’re making a pizza for dinner serve it with a lovely salad and have something lighter at lunchtime such as a wholesome soup. Apart from the occasional treat, we should be trying to avoid the following; fried foods offer very little nutritional value and are very hard to digest so our body has to make a lot of effort to get hardly any benefit. Refined sugar and caffeine both stimulate the body and can cause jittery feelings that can increase anxiety symptoms. Lastly stay away from processed foods, they are full of refined ingredients and empty calories. Learn to look at the back of packets; if it has ingredients that you can’t pronounce then you shouldn’t really be eating it. We want our mind and body to be alert, well fuelled and in the best possible condition it can be. A good diet is a really easy way that we can make sure we’ve done our best to facilitate this. When you suffer with anxiety at times it can feel like your mind and body is at war, a panic attack can leave you feeling exhausted both physically and mentally, proper fuelling first can help to ease this. The inspiration for my pizza topping usually comes from whatever I have floating around in the fridge or pantry, you don’t need a large amount to be able to top a pizza so it’s really handy for using up leftovers. I think the combination of sticky, sweet, melting onions and creamy Goats cheese has to be one of my favourites. It really is a match made in heaven. 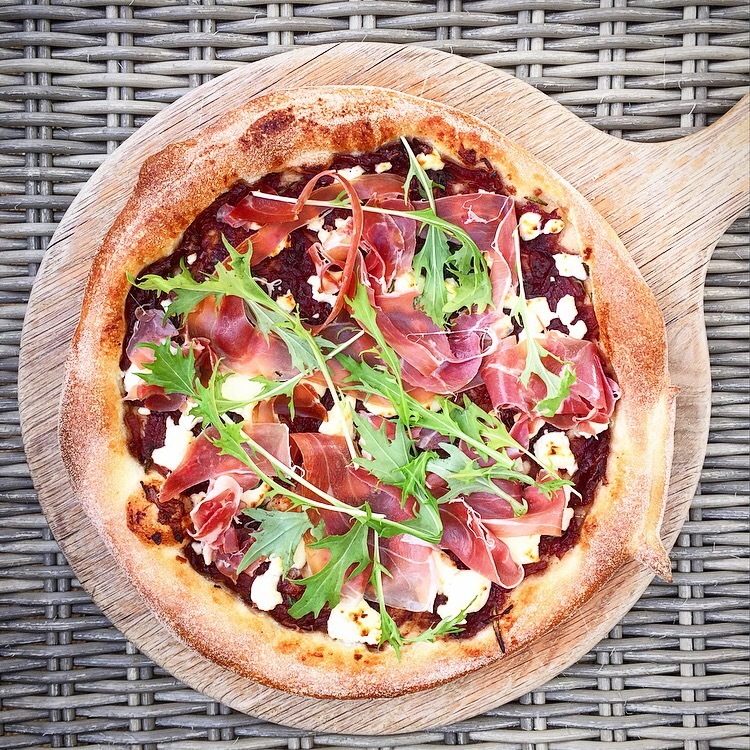 The colours on the pizza look so beautiful that it’s a feast for your eyes as well as your stomach. I love mushrooms and we always have sour cream in the fridge as my other half is doing The Body Coach diet and he has it with pretty much every meal. 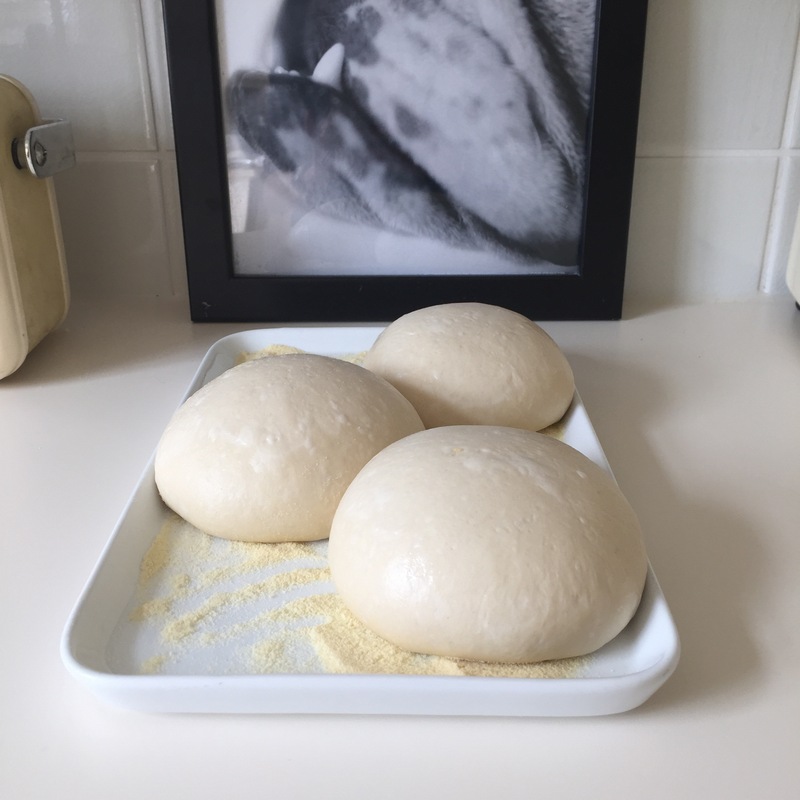 Do try a traditional tomato topped pizza too, I thought I would give you some different ideas but head over to the Pizza Pilgrims website for a delicious tomato and mozzarella topping recipe plus some good pictures that illustrate working with the dough. 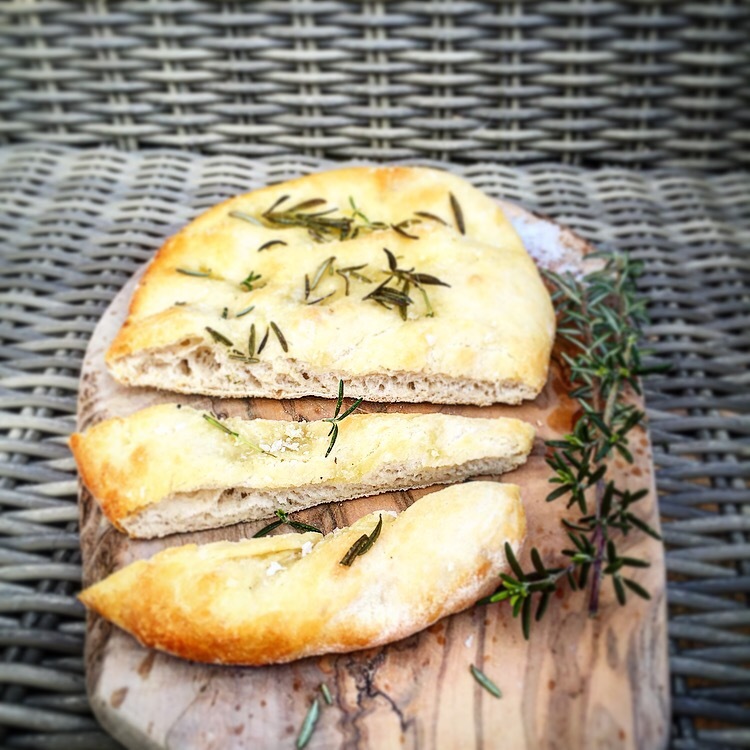 I’m giving you 3 different ways to use this dough, traditional pizza, garlic bread or a lovely small white loaf. This quantity of dough is enough for 3 large pizzas or 2 pizzas and a garlic pizza bread or round loaf, which will feed 4-6 people depending on appetite. 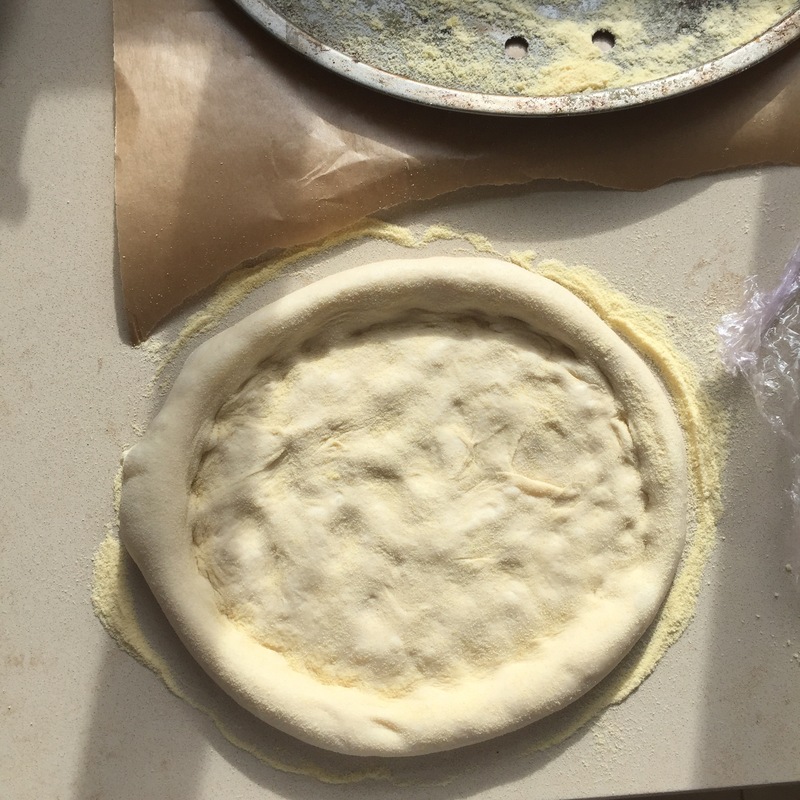 Have a good look at the video on the blog showing how to stretch the dough before you begin. 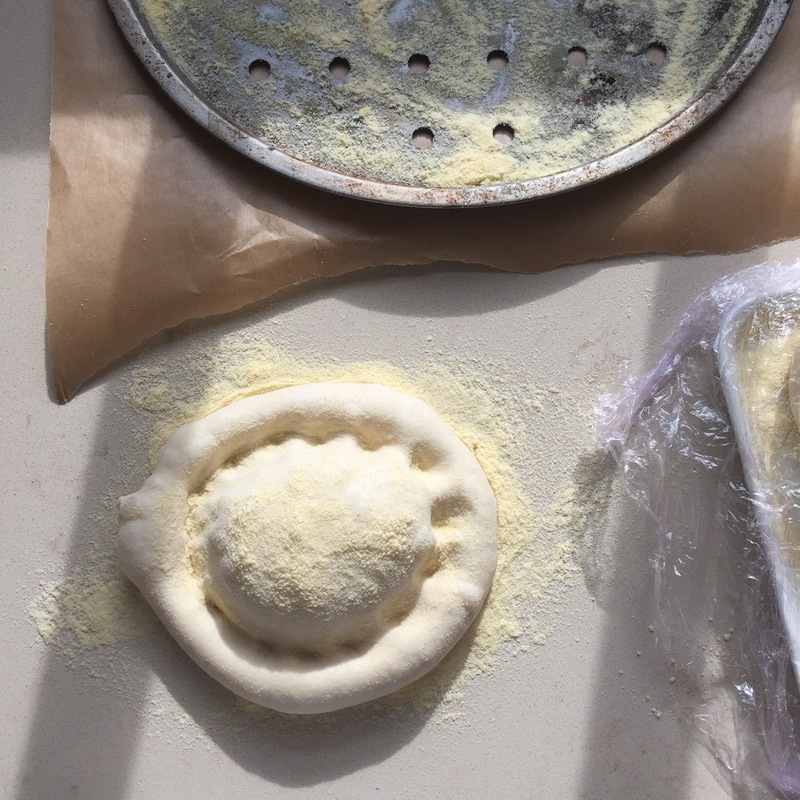 500g 00 flour (sometimes referred to as pasta flour) I use 00 because it’s finely milled so gives you a super soft and silky dough, this makes it really easy to stretch out without tearing. Tip the flour onto your work service and make a well in the centre. Add the yeast, oil and honey in to the water and mix until combined.Pour this into the middle of the well in the flour a little at a time whilst using your hands to bring the walls of the flour inwards so that the water begins to thicken. Once you’ve reached the consistency of custard, add the salt and bring in the rest of the flour until it comes together as a dough. 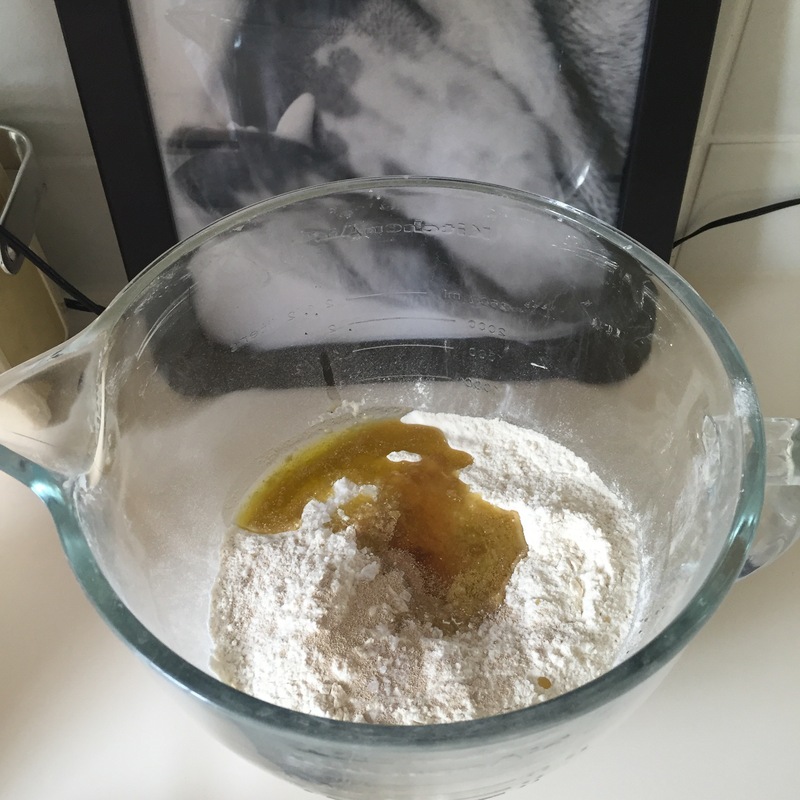 Knead for 10–15 minutes. Alternatively use a mixer fitted with a dough hook, knead on a slow speed for about 8 minutes. Transfer to an oiled bowl and cover with cling film, leave at room temperature until doubled in size, about 1 hour depending on how warm it is. 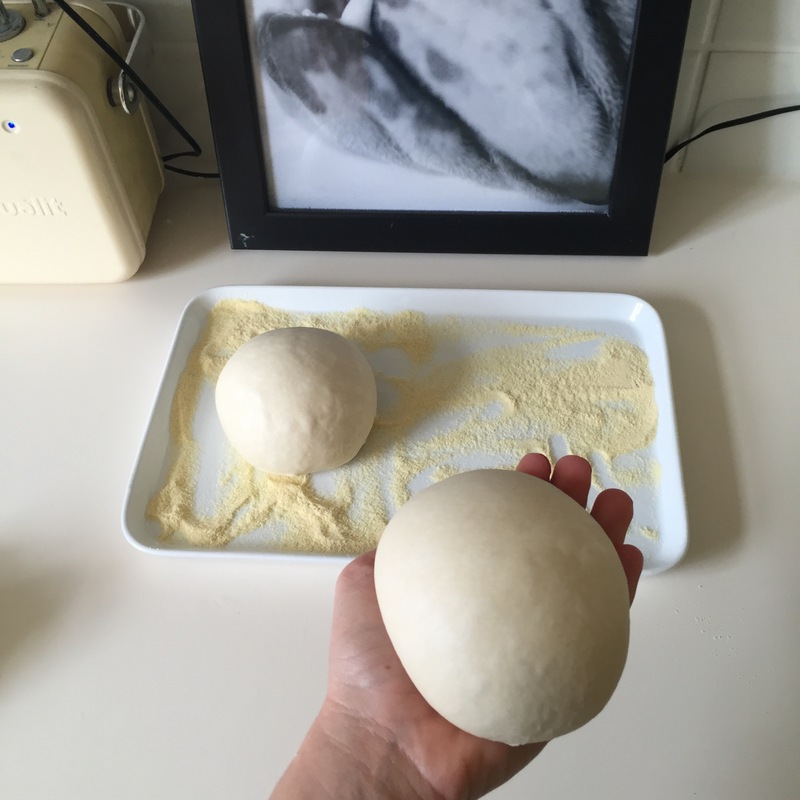 Take the dough ball and knead for a few seconds to knock out the air then divide into 3. Shape each one into a ball by pulling the sides back on each other then transfer to a tray lined with ground semolina. Cover with oiled cling film and either leave at room temperature for about 30 minutes, if you want to make the pizza imminently or transfer to the fridge for 3-4 hours. 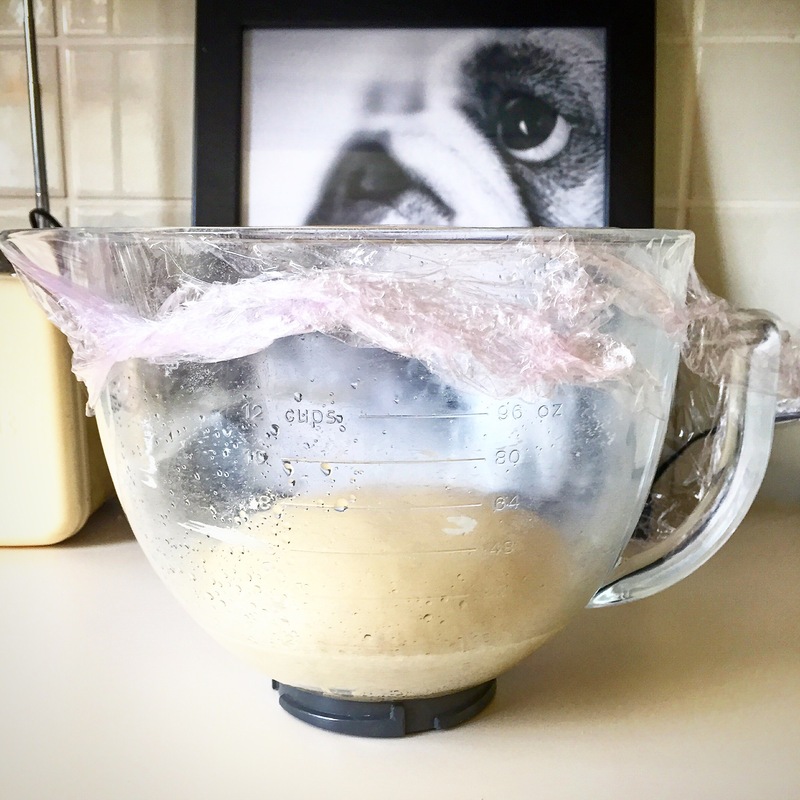 I personally like the fridge method, I make the dough in the morning and then use it in the evening but it’s totally up to you. If chilling remove from the fridge 20 minutes before ready to make. FOR PIZZAS: Heat oven to it’s highest setting. Spray round pizza tray with oil and then dust with semolina. 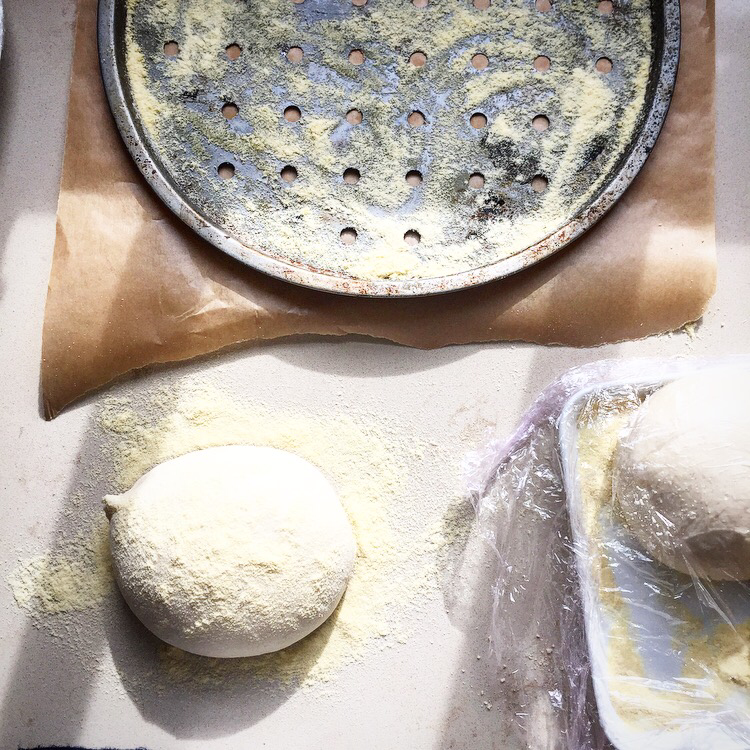 Work on a surface dusted with semolina and use your fingertips to press and stretch the dough (this will make a lot more sense if you watch the video) Or alternatively roll out the dough using a rolling pin, you want a large circle the size of the tray. Transfer to the baking tray then top with your chosen toppings. 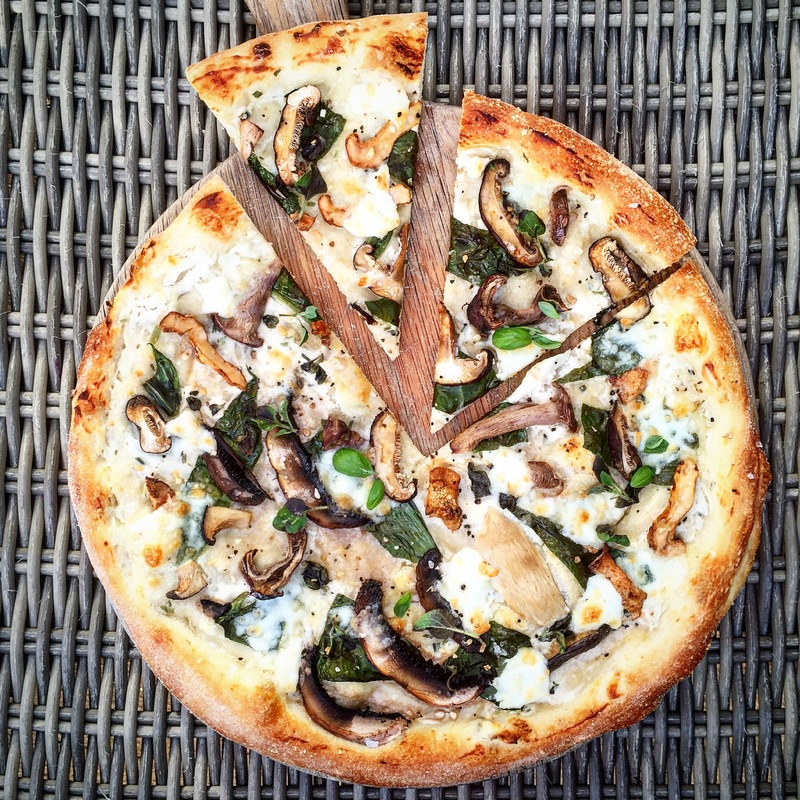 Mushroom Pizza: Spread on the sour cream, add the parmesan then the wild garlic or spinach leaves. Scatter on the mushrooms and mozzarella. Drizzle with olive oil and season with salt and pepper. Cook for 8-14 minutes at the top of the oven, this will depend on how hot your oven goes. It will be easy to see when it’s done, the crust will be golden and risen and the cheese melted. Onion & Prosciutto: Heat a little oil in a frying pan and soften the onion on a low heat, adding a splash of water if it starts to stick, until really soft. Add the vinegar, sugar and Worcestershire sauce. Increase the heat and cook until sticky. Spread on the base. Crumble on the goats cheese, drizzle with oil. Cook for 8-14 minutes at the top of the oven, this will depend on how hot your oven goes. It will be easy to see when it’s done, the crust will be golden and risen. Scatter on the Prosciutto and rocket before serving. 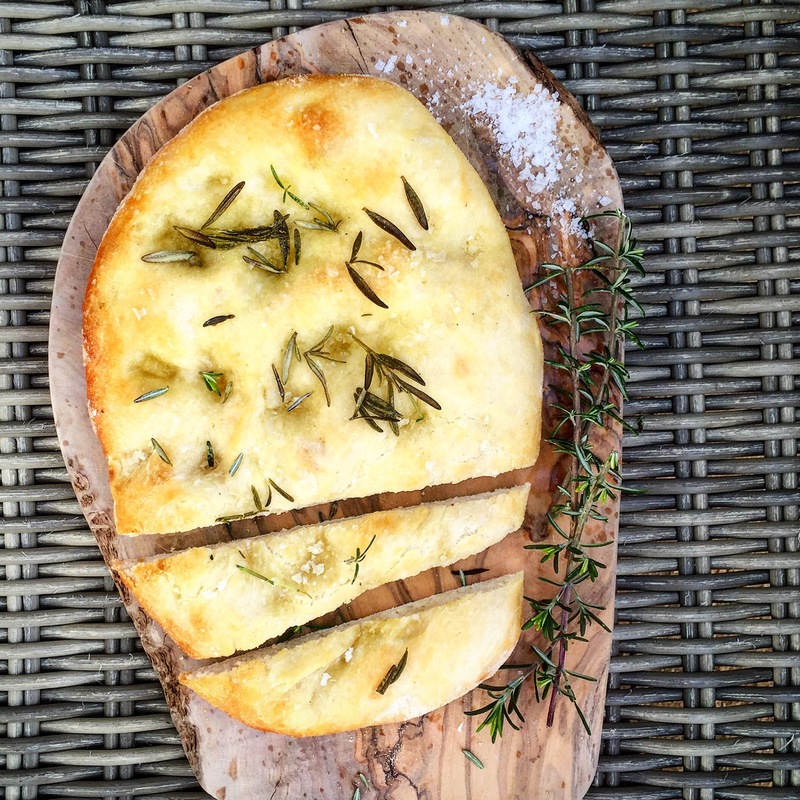 FOR GARLIC BREAD: Stretch or roll the dough to a rough oblong shape, you want to leave it fairly thick, do this on a baking tray that has been oiled. Drizzle with garlic oil, be generous and add some rosemary sprigs and sea salt. Bake for 10-16 minutes on the middle shelf, this will depend on how hot your oven goes. It will be easy to see when it’s done, the crust will be golden and the bread risen. FOR BREAD: leave the ball as it is, gently transfer to an oiled tray. Bake for 14-20 minutes on the middle shelf, this will depend on how hot your oven goes. It will be easy to see when it’s done, it will be golden and risen plus the base will sound hollow when tapped.